made of the highest quality carbon (hard to be found in other water skis) used in aerospace and automotive industry for Airbus, Bentley, Lamborghini, Porsche etc. Like in snow skiing, control over the turn is paramount. RAZOR’s round bevels allow you to carve sharpe and smooth turns. 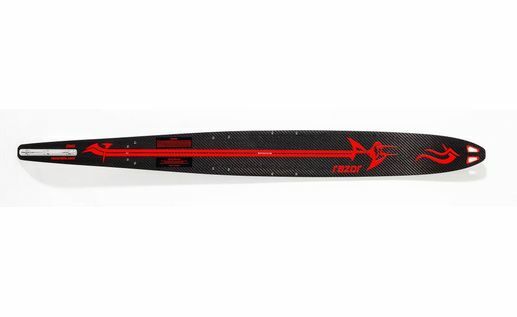 RAZOR is one of the few skis on the market that turns on skier’s demand, without unexpected, sudden dives or bites. you will be able to ski equal onside and offside pulls due to absolutely symmetric torsional flex, which is an exclusive RTM result. the RAZOR offers a surprisingly ease of use for all kind of skiers because of its innate forgiveness.